Tickets to all of our Haunted Attractions go on sale starting September 11th through October 28th at Blossom Music Center. General Admission includes FULL ADMISSION to all 4 haunted houses. 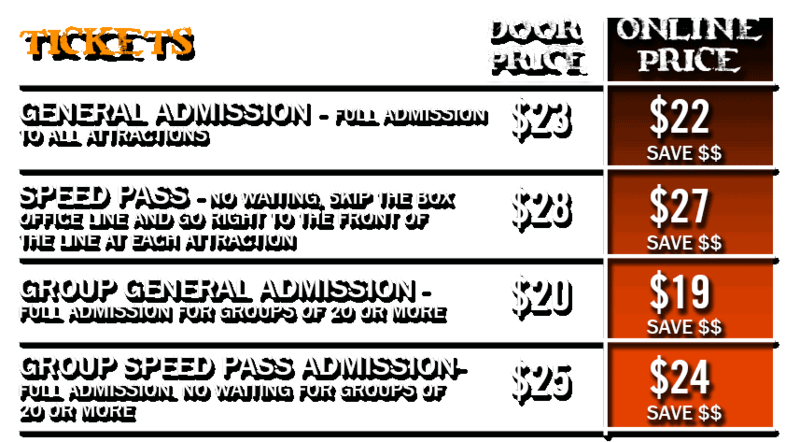 Speed Pass Admission includes FULL ADMISSION to all 4 haunted houses and ACCES THROUGH the VIP Speed Pass Admission Line. Click Here for information on $3 OFF General and Speed Pass Coupons.